A new peer-reviewed journal article on the Houses of Parliament’s Victorian ventilation system has just been published in Architectural History, written by Dr. Henrik Schoenefeldt. The article is entitled ‘The Temporary Houses of Parliament and David Boswell Reid’s architecture of experimentation’ and presents an in-depth exploration of the stack-driven ventilation system that the Scottish physician and chemistry professor David Boswell Reid had adopted and tested inside the Temporary Houses of Parliament. The original environmental systems were reconstructed, using developmental sketches, technical reports and oral accounts, in a series of drawings. 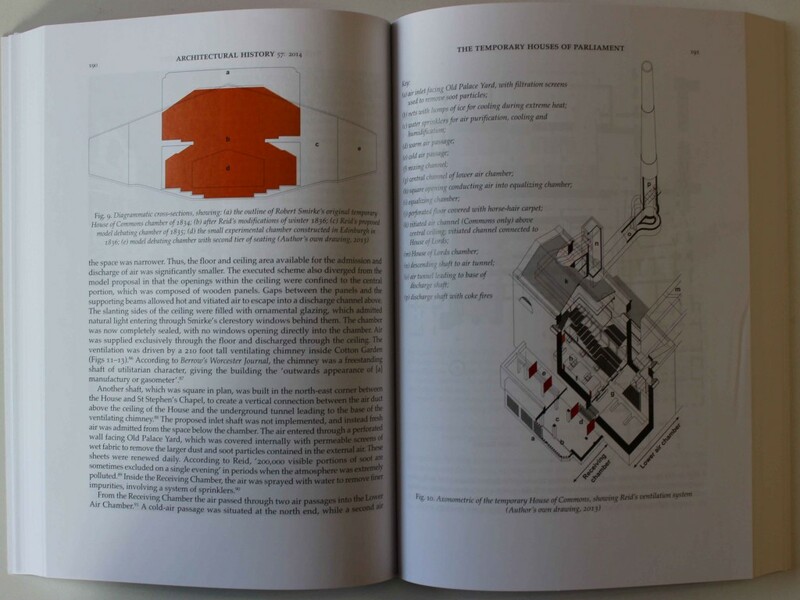 Page from article showing axonometric projection of the House of Commons chamber produced by the author. The Temporary Houses, erected in Westminster after the fire as a preliminary home for the British Parliament, were occupied for several years up until the completion of the New Houses of Parliament. This provided Reid with the unique opportunity to test and optimise a stack ventilation strategy not only over an extended period of time but also under real life conditions. The two debating chambers were used to test and optimise the ventilation system and its day-to-day operation from a physiological, environmental and technical perspective. It also explores in detail the scientific working methods that Reid had originally developed in Edinburgh and how they were applied to the study of the ventilation in the Temporary House of Commons (1835) and in the Temporary House of Lords (1839). This article is part of the author’s ongoing research project, investigating the development of the historic ventilation system of the Houses of Parliament from the mid- 1830s through to the 1940s. Dr. Schoenefeldt is also acting as consultant to the Houses of Parliament, exploring how far the historic ventilation could be revitalised, at least in parts, as part of a sustainable environmental design strategy for the Palace.